Gallery of NCAA college and NFL football from freelance assignments in the north Florida area. Games include the Florida State Seminoles, Florida Gators, Jacksonville University Dolphins and Jacksonville Jaguars. 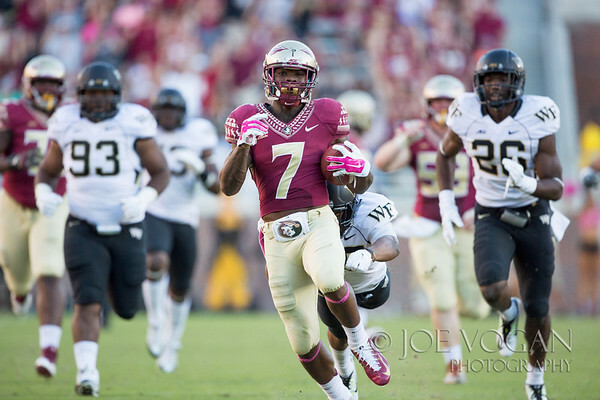 Running Back Mario Pender (#7) of the Florida State Seminoles makes a 56-yard run against the Wake Forest Demon Deacons in the fourth quarter at Doak Campbell Stadium in Tallahassee, Florida on October 4, 2014. © Joe Vogan 2000-2019 All Rights Reserved.